By Dennis W. Viau; modified from a restaurant recipe. 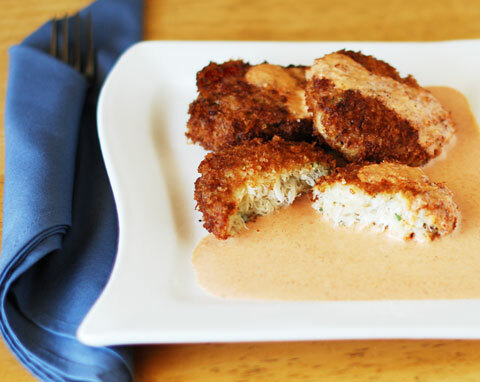 These crab cakes are filled with crab meat. It is best to use good lump crab, the largest chunk you can find in the store. The flavor will be much better. Trim the bell peppers by removing the stem, seeds, and white membrane. Cut into wide pieces and arrange skin side up on a baking sheet. Roast in a 450°F (232°C) oven for 10 minutes with the rack at the highest position, then broil, watching closely, until slightly charred on the surface. Sauté the onions in a large skillet over medium heat until tender and translucent, 6 to 8 minutes. Add the roasted peppers and sauté 1 minute. Add the cream, pepper (hold the salt until later), and basil leaves. Cook 5 minutes. Remove from the heat and allow to cool a few minutes. Pour the sauce ingredients in a food processor or blender and purée until smooth. Filter through a wire strainer, discarding the solids. You might need to push the liquid through the strainer with a large spoon or spatula. Adjust for salt. Cover and set aside. Heat prior to serving. Mix together the crab meat, egg, cheese, minced garlic, sour cream, and parsley. Season with salt and pepper. Shape about 3 ounces (85g) of the crab mixture into a round flat cake. The mixture breaks up easily; so shape gently. Dredge in the flour or bread crumbs, coating both sides. Heat oil in a large skillet over medium heat and fry the cakes until golden on both sides, 3 to 4 minutes per side. Transfer to paper towels to drain. Plate 1 or 2 crab bakes per serving and garnish with sauce, pooling sauce on the plate. Serve immediately.